Astronomers using the MUSE instrument on ESO's Very Large Telescope in Chile have conducted the deepest spectroscopic survey ever. 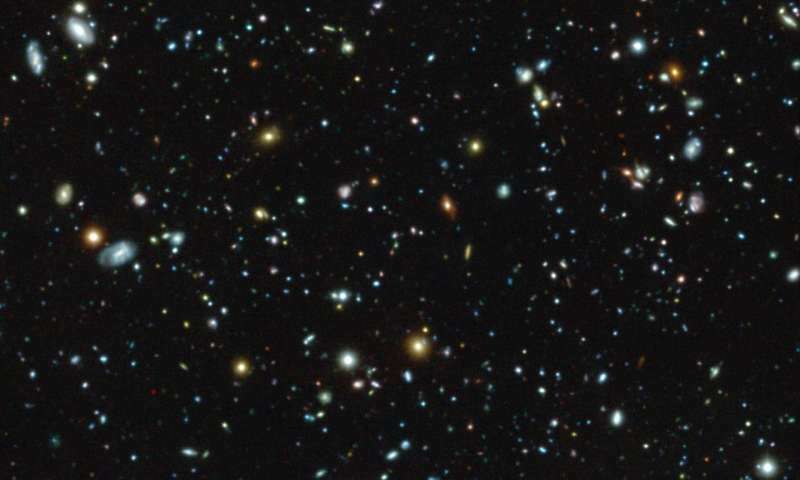 They focused on the Hubble Ultra Deep Field, measuring distances and properties of 1600 very faint galaxies including 72 galaxies that have never been detected before. This groundbreaking dataset has already resulted in 10 science papers that are being published in a special issue of Astronomy & Astrophysics. This wealth of new information is giving astronomers insight into star formation in the early Universe. The MUSE HUDF Survey team, led by Roland Bacon of the Centre de recherche astrophysique de Lyon (CNRS/Université Claude Bernard Lyon 1/ENS de Lyon), France, used MUSE (Multi Unit Spectroscopic Explorer) to observe the Hubble Ultra Deep Field, a much-studied patch of the southern constellation of Fornax (The Furnace). This resulted in the deepest spectroscopic observations ever made; precise spectroscopic information was measured for 1600 galaxies, ten times as many galaxies as has been painstakingly obtained in this field over the last decade by ground-based telescopes. The original HUDF images were pioneering deep-field observations with the NASA/ESA Hubble Space Telescope published in 2004. They probed more deeply than ever before and revealed a menagerie of galaxies dating back to less than a billion years after the Big Bang. The area was subsequently observed many times by Hubble and other telescopes, resulting in the deepest view of the Universe to date. Now, despite the depth of the Hubble observations, MUSE has—among many other results—revealed 72 galaxies never seen before in this very tiny area of the sky. Roland Bacon takes up the story: "MUSE can do something that Hubble can't—it splits up the light from every point in the image into its component colours to create a spectrum. This allows us to measure the distance, colours and other properties of all the galaxies we can see—including some that are invisible to Hubble itself." The MUSE data provides a new view of dim, very distant galaxies, seen near the beginning of the Universe about 13 billion years ago. It has detected galaxies 100 times fainter than in previous surveys, adding to an already richly observed field and deepening our understanding of galaxies across the ages. The survey unearthed 72 candidate galaxies known as Lyman-alpha emitters that shine only in Lyman-alpha light. Current understanding of star formation cannot fully explain these galaxies, which just seem to shine brightly in this one colour. Because MUSE disperses the light into its component colours these objects become apparent, but they remain invisible in deep direct images such as those from Hubble. "MUSE has the unique ability to extract information about some of the earliest galaxies in the Universe—even in a part of the sky that is already very well studied," explains Jarle Brinchmann, lead author of one of the papers describing results from this survey, from the University of Leiden in the Netherlands and the Institute of Astrophysics and Space Sciences at CAUP in Porto, Portugal. "We learn things about these galaxies that is only possible with spectroscopy, such as chemical content and internal motions—not galaxy by galaxy but all at once for all the galaxies!" Another major finding of this study was the systematic detection of luminous hydrogen halos around galaxies in the early Universe, giving astronomers a new and promising way to study how material flows in and out of early galaxies. Many other potential applications of this dataset are explored in the series of papers, and they include studying the role of faint galaxies during cosmic reionisation (starting just 380 000 years after the Big Bang), galaxy merger rates when the Universe was young, galactic winds, star formation as well as mapping the motions of stars in the early Universe. "Remarkably, these data were all taken without the use of MUSE's recent Adaptive Optics Facility upgrade. The activation of the AOF after a decade of intensive work by ESO's astronomers and engineers promises yet more revolutionary data in the future," concludes Roland Bacon. This research was presented in a series of 10 papers to appear in the journal Astronomy & Astrophysics.